Shankar said he was on a hunger strike to press for his long-pending demand for a separate AIIMS here, which needs to be built on outskirts of the city. 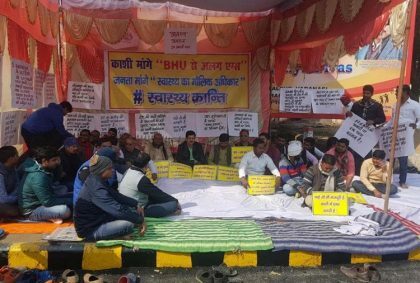 Varanasi: A day before Prime Minister Narendra Modi’s visit to his Lok Sabha constituency to inaugurate the Bharatiya Pravasi Diwas-2019, a BHU Medical College cardiologist Monday sat on a hunger strike to press for his demand of a separate AIIMS outside the varsity campus. Rajya Sabha MP Sanjay Singh Monday said in a tweet that the Aam Aadmi Party extends its support to cardiologist Om Shankar’s demand of a separate AIIMS in Varanasi. Meanwhile, AAP workers too joined Shankar, who sat on the strike outside the BHU’s entrance gates near Singhdwar. BHU Medical College has been upgraded to an AIIMS-like institution but the cardiologist has been demanding a separate AIIMS saying that the varsity hospital was already crowded with patients from neighbouring states as well as Nepal. Medical Dialogues team had earlier reported that in 2018 a MoU was exchanged in this regard between union ministries of HRD, Health and Family Welfare and the UP government at K N Uduppa. Country needs primary health care badly rather spending money on costly super specialties ,needed by even less than half percent of population. But I think that all the doctors support on this strike with Stand Dr. Om Shanker that ll full fill for Their demand .